Speaking in Tongues is a stand-alone thriller by Jeffery Deaver , best known for his Lincoln Rhyme series. The novel is extremely fast-paced and I'll bet fans of Deaver and suspense alike will finish this book within a few hours of picking it up. Megan McCall is a troubled teenager who visits a therapist on a regular basis. Estranged from both parents, Megan is still damaged by the divorce between her free-spirited mother Bett and her attorney father Tate Collier. When Megan is kidnapped by a man posing as a stand-in therapist, Bett and Tate come together in a search for her. Little do they know that the kidnapper, Aaron Matthews, has distant ties to Megan's parents and is out to hurt the entire family in the process. In comparison to the other ten novels I have read by Deaver, Speaking in Tongues lacks in the deep character development that is normally prevalent in Deaver's works and has a very condensed style. Although the book is well over 300 pages, it just seems too quick and shallow. This may also be because Tate's character is very detached and we don't feel as intimate with him as we do with Deaver's other protagonists. 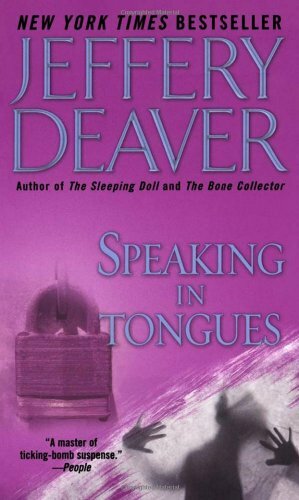 Speaking in Tongues also seems to lack in Deaver's usual massive amounts of forensics, mind-tricks, and creepy gore and violence. These components are there, but just not in high doses. I highly recommend reading the Lincoln Rhyme series beginning with The Bone Collector (which has also been made into a movie featuring Denzel Washington and Angelina Jolie) and continuing with The Coffin Dancer . My favorite stand-alone novel is The Bodies Left Behind . Jeffery Deaver is my favorite author of suspense thrillers!